Ever watched the movies The Road to El Dorado, The Princess and The Frog, Mary Poppins Returns, or Frozen? Well, Frans Vischer, an accomplished artist with more than thirty years of experience in the animation industry, worked in the animation department for each of those films and many more. Not only is Vischer an animator, but he is also a children’s book author and illustrator who created the story of Fuddles, a cat who gets wrapped up in thrilling adventures, which he brought to life at Longley Way Elementary School (LWES) for the Longley Way Parent Teacher Association (PTA) Family Night! To launch the stellar evening on March 8, the doors opened for families to enjoy a community picnic dinner. 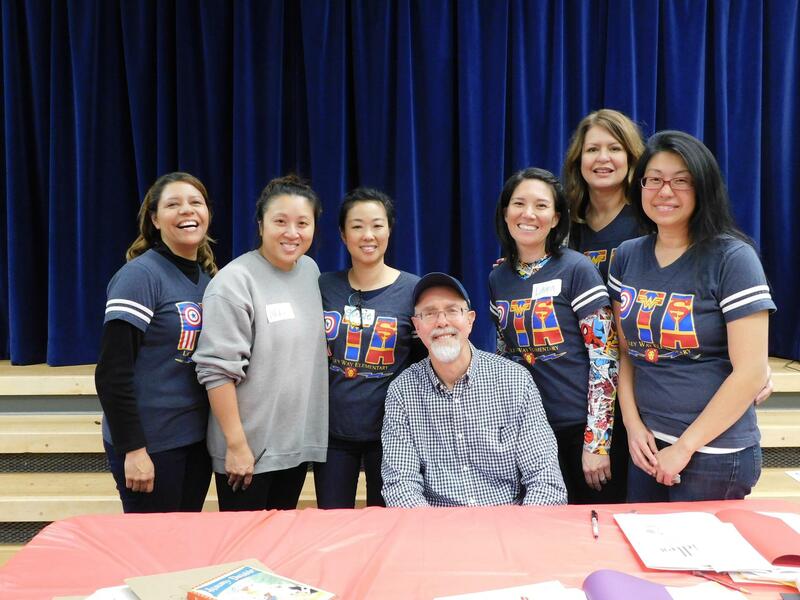 Longley Way’s PTA, Principal Travis Long, members of the Arcadia High School Honor Society and Kare 4 Kids club, staff, volunteers, and of course, Frans Vischer, were there to give the families a hearty welcome with beaming smiles and an eagerness to make an unforgettable night. Frans Vischer commenced his presentation talking about his personal life story with dazzling anecdotes about what sparked his passion for drawing. “I was raised in Holland until age 11 before moving to California. Growing up, I loved comic books such as Tin Tin and Asterix and Obelix and used to spend hours copying drawings from a Donald Duck magazine. When I moved, I didn’t speak English well. I remember how I used my drawings as a language to communicate with peers and teachers,” said Vischer during his presentation. From the deftness behind shading and perspectives to the composition and storyboards for animated films, Vischer described all the elements involved in creating the animation and illustration for award-winning films. Subsequently, he dazzled the audience with the enthralling tales of Fuddles. Imitating animal sounds and earning giggles from the children, he enthusiastically read his books Fuddles, Fuddles & Puddles, and A Very Fuddles Christmas aloud for all the kids to enjoy, which he followed with a drawing demonstration, guiding the little ones with his avid traces as he put pen to paper. 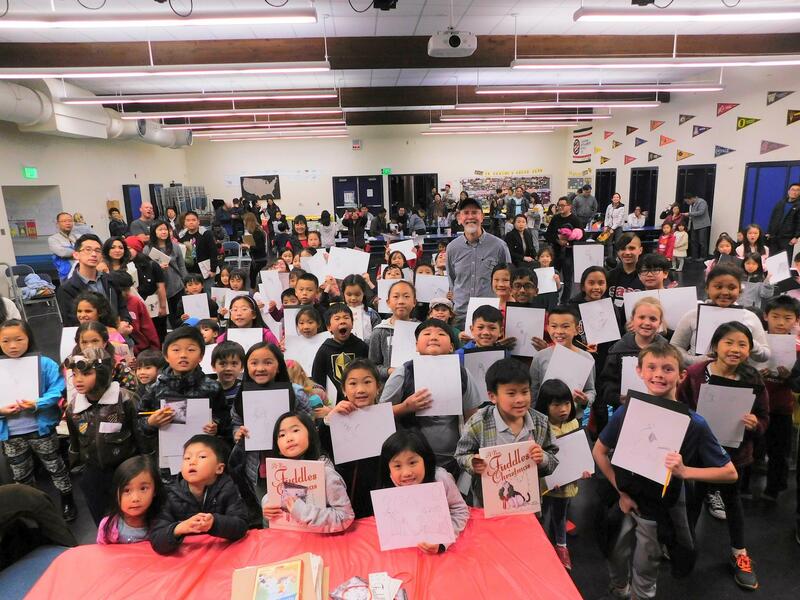 “I liked the drawing part where I got to draw Fuddles because I like drawing, and after doing this, I think I’m good at it,” said Longley Way student Stephanie Kim. A line extended from one side of Longley Way’s Multi-Purpose Room to the other so that all those who purchased a hard-copy of Fuddle’s stories had the chance to take pictures, have a meet-and-greet with Frans Vischer, and get an autograph. Everyone had an opportunity to chat with the affable animator, as he stayed until the very last person had departed. Longley Way students collectively put together a batch of thank-you letters addressed to Frans Vischer, expressing their gratitude for his extraordinary presentation and thanking everyone who made this event possible. “Anything you want to do, work hard at it. Give yourself room to find what you’re passionate about so you’ll be able to get through all setbacks. I’ve learned to persevere no matter what, and I can assure that only happiness lays ahead. Everyone has their own story to tell. Find your way to express yourself!” Vischer exclaimed.